The alarmingly shrinking expansion of Arctic sea ice, which receded to an unprecedented annual minimum last autumn of 2012, presents nations like Canada with a wildly uncertain future. Not only does this seasonal low, along with harbingers like shifting precipitation patterns and rising sea levels, attest to the now globally-observed increase in yearly average temperature, it reasonably reinforces the likelihood of the Intergovernmental Panel on Climate Change’s (IPCC) estimates forecasting summer Arctic sea ice to vanish entirely by the end of the century, once an outlandish prospect. Likely in part due to human activities such as the burning of fossil fuels, the Northwest Passage that eluded countless adventurers searching for a maritime shortcut from Europe to Asia might suddenly emerge as a modern reality and point of contention. While an economically viable Northwest Passage offers Canada opportunities for enhanced trade and resource access, conflicting regional effects of climate change and ambiguous international responses to highly-contested polar boundaries will ultimately outweigh such a route’s benefits for the country’s interests. With an already burgeoning population of skilled workers, Canada’s economic potential appears only magnified by more accessible fishing grounds; millions more ecotourists hoping to witness polar bears and other vestiges of the melting Arctic; and untapped oil and natural gas deposits (approximately 13% and 30% of global undiscovered reserves respectively, according to the US Geological Survey)—all of which are associated with Arctic sea ice retreat. However, while considerable absence of thick multiyear ice may allow costly tankers, barges, and cargo vessels extended traveling ranges, sharp remnant chunks of sea ice and land-borne icebergs will ensure slow, seasonally variable, and treacherous summer transport through the briefly ice-free Northwest Passage. Though a thinner atmosphere and accelerating albedo feedback cycles (where iceless ocean absorbs more ice-zapping heat) accentuate the rate of warming over northern polar regions, unimproved net agricultural yields and deteriorating ice-dependent winter roads could complicate shipping gains. In other words, warmer temperatures may boost production of crops northward of currently arable land, but drier conditions may ultimately decrease harvests in southern prairies. In the same way, increased ice-free sea transit during a short window of time at the end of summer probably will not offset the economic hindrances of losing months-long service of ice roads and rail routes that depend on cold temperatures for stability to deliver regional resources and valuable commodities like diamonds, petroleum, and grain by land.Especially considering how increased international market exposure will not only incline maritime arteries like the Panama and Suez Canals to lower their tolls, but also spell an uncertain fate for competing “destinational” shipping interests locally supplying and servicing booming outposts like Churchill, Iqaluit, and Tuktoyaktuk, the thought of Canada reaping lucrative profits in all economic sectors from a functional Northwest Passage in the coming decades certainly lies on thin ice. Recent statistical investigations of Canadians involved in Arctic affairs highlights general support, despite varying methods, for polar development, yet vying foreign claims for unsettled sea territory, fossil fuel and marine resources, and multinational sovereignty over Arctic waterways overshadow Canada’s own strategic Northwest Passage development plans. Since the evaporation of Cold War era tensions, a recent surge in Arctic militarization and charged nationalist rhetoric over extending northern maritime boundaries up to 200 nautical miles from shore in accordance with the United Nation’s EEZ (exclusive economic zone) recognition prompts heated international stalemate and demonstrates how effects of climate change blur traditional notions of sovereignty over land and resources. While locals draw resources from frozen waterways the same way as on land and Canadian officials assert authority over inter-island marine passages, multinational (particularly American) critics identify an increasingly navigable Arctic shipping route in a global light, as linking two nationless bodies of water, further complicating proper recognition. Already, Russia’s move to stake its flag over the North Pole in 2007 and Canada’s calls to construct another costly Arctic military base in Resolute Bay and strengthen its fleet of patrol ships and icebreakers (securitizing steps not unlike those of other Arctic nations) reinforce the inescapable, often superseding role that politics will play in shaping the uncertain fate of the Northwest Passage amidst climate change. Even as warmer temperatures thaw a region primed for increased economic activity, international boundary delineation over shifting environmental factors and competing national interests ultimately possess the power to encourage or discourage greater economic interconnectivity of Canada’s Arctic ports with North America and beyond. 1. 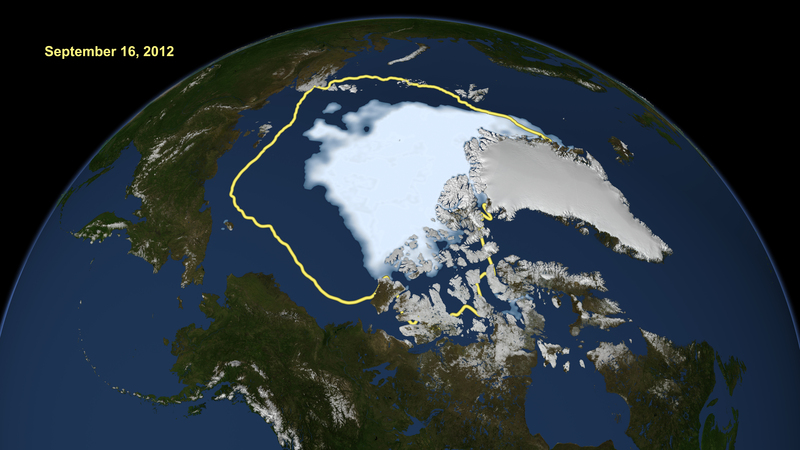 Maria-José Viñas, “Arctic Sea Ice Hits Smallest Extent In Satellite Era,” NASA, September 19, 2012, accessed October 13, 2012, http://www.nasa.gov/topics/earth/features/2012-seaicemin.html. 2. Intergovernmental Panel on Climate Change, Climate Change 2007 Synthesis Report: Summary for Policymakers (IPCC Fourth Assessment Report, 2007; http://www.ipcc.ch/pdf/assessment-report/ar4/syr/ar4_syr_spm.pdf). 3. L. C. Smith, The World in 2050: Four Forces Shaping Civilization’s Northern Future (Plume, New York, 2011). 7. S. Chaturvedi, in Global and Regional Problems: Towards an Interdisciplinary Study, P. Aalto, V. Harle, S. Moisio, Eds. (Ashgate, Burlington, VT, 2012), chap. 8. Climate change may have taken a backseat to other issues in the United States, but around the world, countries and states are collaborating to ease their footprint on the global climate. With an increase in extreme weather patterns, droughts, food shortages, and the threat of rising sea levels, the effects of climate change are a reality. Regulation has finally manifested itself in many countries around the world as cap and trade measures. Cap and trade is known to be a more aggressive form of climate change policy, but its effectiveness when applied on a multinational scale has been questioned by policy makers, environmentalists, and economists. Cap and trade, also known as emissions trading, is a market-based solution to global warming that transforms the right to “pollute” into a commodity that can be traded in the free “carbon” market. In contrast to carbon taxes, which are a form of carbon pricing levied on producers in direct proportion to their greenhouse gas (GHG) emissions, cap and trade policies place an upper limit, or “ceiling,” on the quantity of emissions. An important distinction is that while cap and trade might be better suited for some regions, carbon taxes or other price-based regulations might be more effective in others. For example, the Environmental Protection Agency (EPA) states that cap and trade is well-suited for local and regional emissions since it must be tailored to a specific area’s economic characteristics and demand for pollution. Some places that are currently pursuing or employing cap and trade regulation include Australia, New Zealand, South Korea, Japan, China, the European Union, parts of Canada, and California. International cooperation on climate change has taken place since the adoption of the Kyoto Protocol in 1997. Many countries have since pledged to decrease their GHG emissions and cut down on the use of nonrenewable energy sources. The U.S. EPA has pledged to decrease GHG emissions by 25% of 2010 levels by 2020. The EU has a similar goal of reducing emissions by 20% of 1990 levels by 2020. The advancement of cap and trade policies to achieve these goals shows a different side of international cooperation. Countries are using each other as models for the implementation of cap and trade and integrating their carbon markets with neighboring regions. The most recent example is the California and Canada partnership, in association with the Western Climate Initiative. The California Air Resources Board (ARB) is working with its equivalents in British Columbia, Ontario, Quebec, and Manitoba to create a program through which pollution permits can be bought and sold on the carbon markets of international partners (projected to begin in 2013). Thus, the real concern that arises is whether cap and trade is sustainable when these carbon permits are traded in large, global carbon markets—which are more difficult to regulate. Cap and trade on a national scale has been successful in the past. The EPA’s Acid Rain Program to control sulfur dioxide emissions in 1990 was widely successful and resulted in social savings of over $70 billion per year, with the benefits outweighing costs at a 40:1 ratio. The trading of permits for sulfur dioxide emissions only occurred nationwide under this policy. However, when employed on a larger scale, the carbon market can be volatile and subject to the influence of external forces such as politics and differences in trade regulations between countries. The European Union Emissions Trading System (EU ETS) demonstrates how a well-functioning policy can turn into chaos when applied on an international scale, where prices and quantities are not carefully regulated. First, the EU failed to accurately estimate how many permits would be necessary and issued a surplus of carbon offset permits leading to a price collapse (permits were bought at almost no cost). Trying to set a quantity limit for 30 nations that differ in their industrial composition and emissions is a complex task. Second, the quantity of the permits issued has been under significant political influence by lobbyists asking for more offsets than initially allocated as a “subsidy” to certain energy sector firms (estimated to account for £20 billion or $32.2 billion through 2012). This defeats the primary purpose of having a cap and trade mechanism: to set limits on carbon permits. Yet, when applied in a smaller setting, the policy is relatively safe from extensive political involvement, it accounts for differences between regions, and price volatility can be monitored carefully. The success of cap and trade policies, as they begin to link together countries and span across larger regions, will rely heavily on learning from previous experiences such as the EU ETS. Cap and trade policies that are implemented with precision, transparency, and regulation have the potential to generate changes in the climate that can set the world back on course to reducing GHG emissions. The economic incentives generated by successful cap and trade policies are unparalleled in that they maintain competition between firms and thus, encourage green investment. Countries that are in the early stages of creating their emissions trading programs, such as Japan and China, should construct the program with mechanisms built within it to adjust quantities regionally and to carefully monitor the market. Cap and trade has empirically proven to reduce GHG emissions, but, what remains to be seen is how these various international carbon markets will interact with each other in the future, and whether or not they will spur the use of “greener” energy sources to create sustainability of the policy and the global environment in the long term. Facts and figures from the California Air Resources Board, the Carbon Trade Watch, Council on Foreign Relations, Environmental Protection Agency, and Western Climate Initiative.